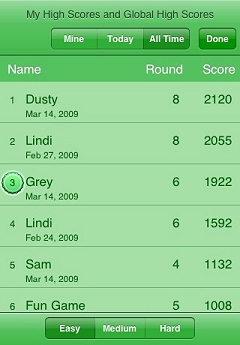 For the last month, the team has been working on Global High scores for WordPop for the iPhone and iPod Touch. A real challenge was how to lay out the screen. Wyatt was driving the effort and through several iterations with Jim and I, a series of screens were created and tested. 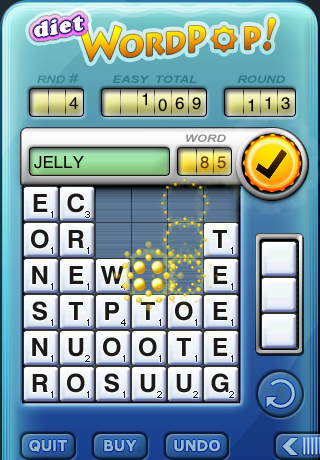 The driving goal of the High Score screen was to allow players to easily and quickly compare their scores to other players. It was complicated because we have three different scores, Easy, Medium, and Hard. It was a lot of information to squeeze into one page. It was tempting to split this to separate screens. The feedback from our testers to Wyatt was very helpful and I am very pleased with the final vesion. A feature we added that is not new, but not seen too often, is Today scores. Typically, All Time high scores are posted and compared. However, I wanted new and occasional player to see how they are doing in comparison to others. The Today High Score posts scores from the last 24 hours, Pacific Time. It has been great fun watching the Easy, Medium, and Hard lists fill up through out the day. I highly recommend all owners of WordPop for iPhone to upgrade to the latest version. 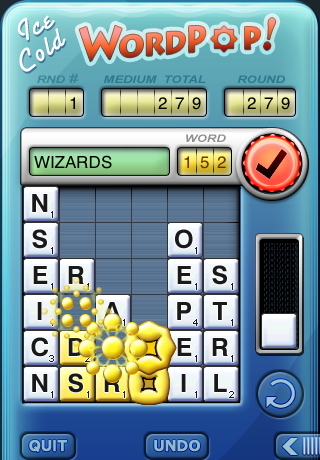 It is free and the new feature is a real incentive to get those high scores. I know during testing that I really wanted to beat some of the other scores I saw. Click here to download the latest version from the Apple Store. 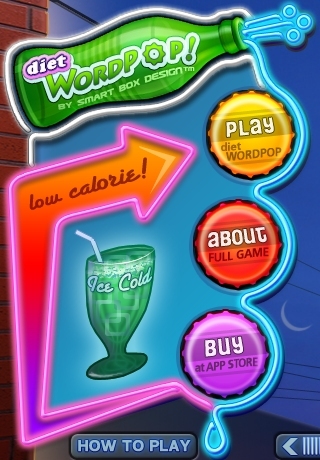 We are thrilled to announce Diet WordPop! Same great game but with fewer calories. Diet WordPop! provides a risk free experience of the game and if you fall in love with it and want the full version, we’ve included a convenient buy button right in the game. If you don’t want to upgrade, but love the free version, we hope you tell your friends, family, and co-workers about WordPop! Get the free version here. Fewer calories but fully entertaining. We love receiving suggestions and comments. Email us at support@smartboxdesign.com.